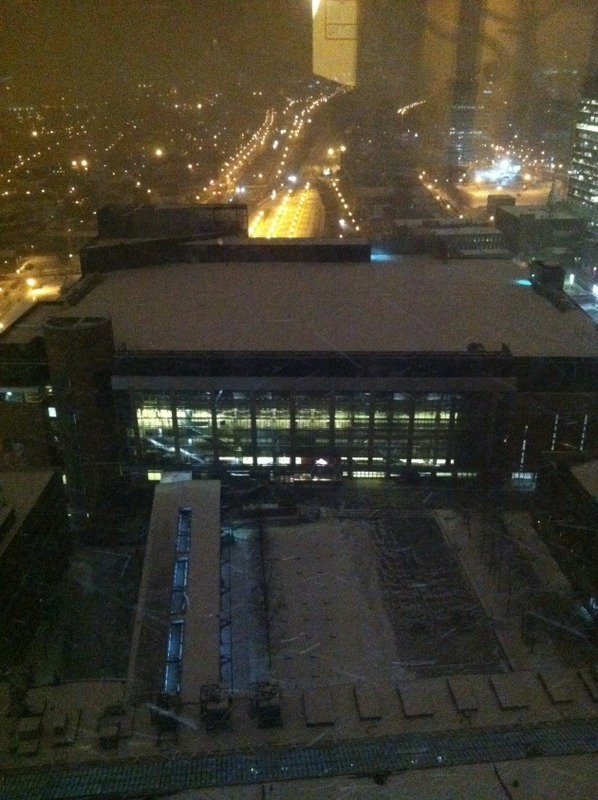 Bell Centre from the light of a snowy day, and a snowy evening, from my hotel. 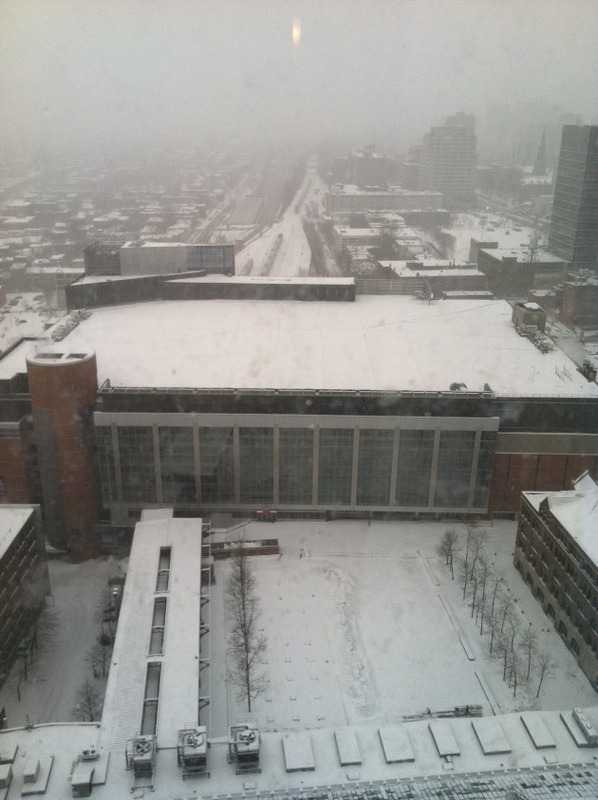 Good day from Montreal, where the Wild visits the Canadiens, the last-place team in the Eastern Conference, tonight. 6:15 p.m. CT puck drop. This will be the first meeting since the Habs came to Minnesota and edged the Wild by an 8-1 score. Niklas Backstrom is in the cage tonight, meaning Josh Harding almost certainly starts tomorrow in Detroit. That leaves one extra: And the winner is? Erik Christensen, who has no points in 12 games and is a well-earned minus-11. The final straw was the second goal the other night. Marco Scandella and Tom Gilbert were playing the system to perfection. Problem was the system Gilbert was playing was, understably, Edmonton's. So when Scandella went to reverse the puck thinking Gilbert would be a few feet from him, Gilbert was actually on the other side expecting a D-to-D pass. Still would have been no problem though if Christensen wasn't swinging away from the play and going up ice. That left Scandella with precious few options, he turned the puck over, and Anze Kopitar hit a wide-open Dwight King in front of the net. Gilbert's gotten more of a tutorial on the Wild system the last couple days. Basically, the Wild wants to reverse the puck in that situation and go up the boards along the strong side of the ice. Yeo said it's one thing not to score, but it's another if you're continually on the ice for goals against. Hence, that's why Christensen won't play tonight. The next short leash in my opinion is Johnson. He also made some very poor defensive-zone reads the other night that cost goals and that's been happening a lot lately. Brad Staubitz will make his home debut coincidentally against his old club tonight. Claimed off re-entry waivers Monday by Montreal, Staubitz earned 17 penalty minutes in his debut in Tampa, including 12 minutes without even being on the ice. He reached into a Ryan Malone scuffle and became the first Canadien in the franchise's stories history to get his first PIM's without being on the ice. He was funny this morning. He did say no chance he fights Kassian. He said ideally he'd like to get his first goal and had a couple IOU's to cash in. Bring up Staubitz to any Wild players ever, and they start laughing. He's a character and teammates loved the guy. He said he expects it to be a fun game against his old team. He did say he wishes he paid more attention in French class so he could communicate more with the local press. Staubitz is behind this horde. Speaking of French, Clutterbuck held court with the French media this morning. If you remember the big piece I wrote on Clutterbuck in 2009 (how couldn't you? ), his mom,, Jocelyn, is a teacher in the French Catholic School system in Welland, Ont., he went to a French school until Grade 8, he speaks to all the Wild francophones in French and talks behind his dad's back to his mom in French (just a kidding). He actually said his dad has started to get the gist of what he says to his mom in French. I talked to Clutterbuck about his short fuse lately, and that'll be in tomorrow's paper. Scandella, who hails from an Italian section of Montreal, will play his first game against the Canadiens in front of 16 family members tonight. Check out my Sunday column this week. I'll be talking a lot about next season and all the Wild prospects about to turn pro. Charlie Coyle is the latest to sign on. The 28th pick in the 2010 draft got the same contract Saint John teammate Zack Phillips, the 28th pick in the 2011 draft, signed. $832,500 annually in the NHL, $92,500 signing bonus, small performance bonuses. A lot of the Wild kids should be heading to Houston on amateur tryout contracts when their respective seasons end. Coyle and Phillips though could have long playoff runs with Saint John. By the way, I've been saying lately that Phillips would have to return to junior next year if he doesn't make the team. I am wrong. He can go to Houston. One guy I'm wondering if we see in Minnesota is Brett Bulmer. Technically when his season ends he can be recalled by the Wild. That would be his 10th game, which means the Wild would burn a year of his contract, but with all these kids starting at once next year, as I've mentioned before, it wouldn't be a bad idea to start Bulmer's contract now so all these first contracts aren't expiring at the same time. The Wild, by the way, is at 49 contracts. That means if they're going to sign college free agents, only one contract could start this year if they wanted it to. But the Wild has to start counting contracts for next year with so many kids turning pro, so I don't see the Wild being very aggressive on the college free agent market. They'd like to add more depth on defense if they could, so maybe they sign a defenseman or two. But the Wild, I think, would only go after guys that definitely have a chance to one day play in the NHL. The college free-agent market is interesting. It's getting to the point where teams are brawling with each other to sign American Leaguers. That's it for me. Talk to you tonight.